Cooling Down Instantly - Cold Towels cooling down instantly,magical cooling effect can last up to several hours,drape it over your neck,head,wrist,wherever else you need to stay cool. Portable - Cooling towel is compact and lightweight,folds up into a portable waterproof pouch and takes up little space in your bag. It is easy to carry when hiking,camping and travel. Wide Application - Perfect for outdoor activities,indoor exercise,gym,hot yoga,cycling,hiking,golf,football,indoor exercise,heatstroke prevention,sunscreen protection,cooling while absorbing. Comfortable and Breathable - Instant cooling bandanas is made of breathable mesh material,soft feel and chemical-free.It works on the physical evaporation of moisture to draw the sweat away from your skin to keep you cool. 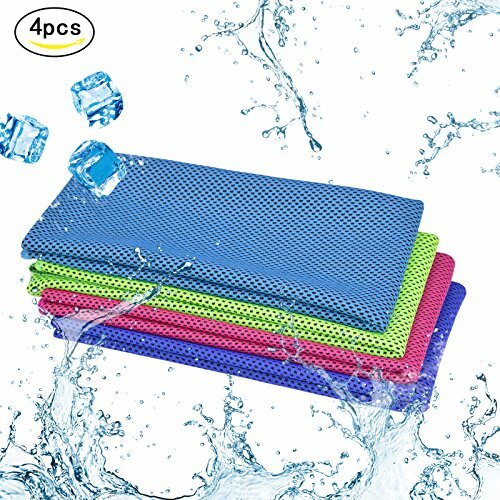 4 Pack Cooling Towel - 4 Pcs cooling towels in 4 different colors (green,pink,lake blue,royal blue).This cooling neck wrap great for ice cool feeling,perfect for your whole family when do outdoor sports or traveling.